This is a RE-ENGRAVED edition of this famous sonata - that is to say, it is a definitive modern edition in modern notation. Newly edited from the original first edition (of which a facsimile is also included in an appendix). 30 pages, 1986. 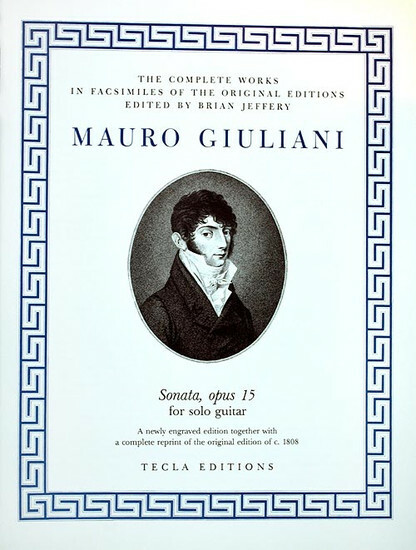 Free on request to purchasers of Volume 3 of Giuliani's Complete Works. Unlike other editions on the market today, this one starts from the original 1808 edition and establishes a completely new modern re-engraved text, rigorously authentic and without any changes from the original. Anyone wishing to play this work in public, or to record it, will find that this edition provides the authentic text. There is a preface setting out the circumstances of the original edition. The re-engraving makes for excellent reading.